Situated within one of the luxury real estate communities in Henderson, NV, Dragon Gate is a prime location of custom homesites that offers unmatched panoramic views of Las Vegas Valley. The custom lots on Dragon Gate are excellent choices to build your own luxury homes on the McCullough Mountains. MacDonald Highlands is the premier developer of luxury real estate in Southern Nevada. Dragon Gate is a magnificent ridge of only 12 hillside lots on a private street in one of the luxury real estate communities in Las Vegas, NV. The heightened elevation offers breathtaking views of the Las Vegas Valley and its mountain range. The surrounding majestic mountain ranges like the McCullough Range, Sheep Range and El Dorado Mountains make MacDonald Highlands’ luxury custom lots even more desirable. These custom home sites are intended for multilevel estates. The upper hillside will be left in its natural state while the lower hillside will be transformed into stepped lots for a cascading home design. The custom home sites range from 1/2 acre to 3/4 acre parcels with prices starting from $950,000 and up. 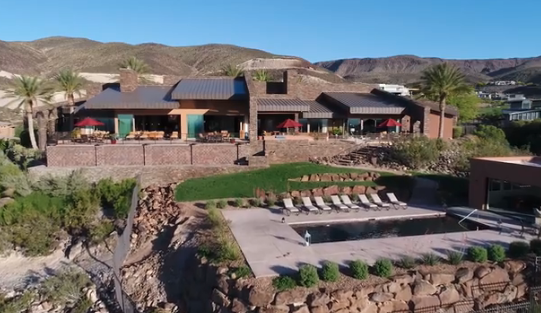 The luxury mountainside homes in Henderson, NV, located within MacDonald Highlands are also thoughtfully positioned and designed to incorporate the element of nature into the luxury home lifestyle. The rockery walls are stained a beautiful dark brown to mark the terracing of the custom lots on the lower hillside. Lush landscaping within a 10-foot easement adorned the bottom lower home sites putting the polished touches to the esteemed MacDonald Highlands’ neighborhood.